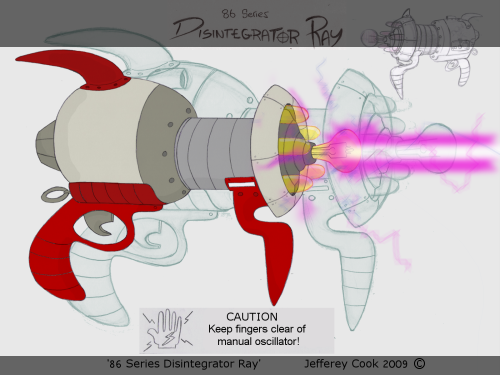 Here is my Ray Gun design. The '86 Series Disintegrator Ray'.It's features include a Pump-Action oscillation mechanism, a Handy Belt ring, a Nifty Tail Fin and blast settings ranging from a Mild stun to a Full Bodied Disintegration. "Just point, pump and shoot." Hopefully I'll work this puppy into an animation one day. I left the ray gun pretty late and only just got it submitted on time, even then it was missing a few extra bells and whistles that I wanted to add to it. Having a working scanner again really worked well for these designs as I'm still faster at hand drawn clean up over digital clean up.